A custom made 7” screen was recently developed for use in a Taxi environment to deliver information & entertainment and to increase the customer experience. Alberta CO-OP Taxi was established in 1971, by three taxi drivers whose aim was to create a company in which the drivers had a say in the business they were involved in. From the first day of 4 dispatched trips to today, almost 35 years later CO-OP has grown to be Edmonton’s largest fleet with over 553 vehicles, 850 drivers and over 5 million calls a year. CO-OP Taxis wanted to introduce a service to its customers which enhances their experience within the Taxi while completing their journey. The content needed to be informative, educational & entertaining while also including advertising by local companies which are relevant to the customer base and help to finance the investment being made. The 7” screens needed to be installed across a large fleet of varying vehicles using the head rest brackets. The challenge was to manufacture a bracket which worked across all these vehicles while holding the screen firmly in position yet being fully adjustable. The screen itself had to be extremely robust to withstand the rigours of everyday taxi life including night-time customers. TOPAZ Digital designed a custom 7“ screen in a mild steel housing with fully protective glass on the front. A customised power supply, used within the automotive industry was also incorporated so that the power board didn’t burn out over time as the power to the vehicle was switched on & off on a regular basis throughout the day. The screens had a fully adjustable bracket which held the screen in place on the upright bars of the head rests while allowing the headrests to be fully adjustable. The screens are fully adjustable to maintain the best viewing angle. Content is updated on demand via a Wi-Fi connection that is available in each CO-OP Taxi. The screens will be installed as each vehicle is brought into the service area so will be fully deployed over a short period of time. The initial reaction from the CO-OP and the customer has been very positive. Uday Kumar, General Manager of CO-OP Taxi states “We are excited about this new initiative and see this as a great service to our customers moving forward”. The network of displays will inform riders of the various products and services in and around Edmonton, as well as entertain them during their trip. 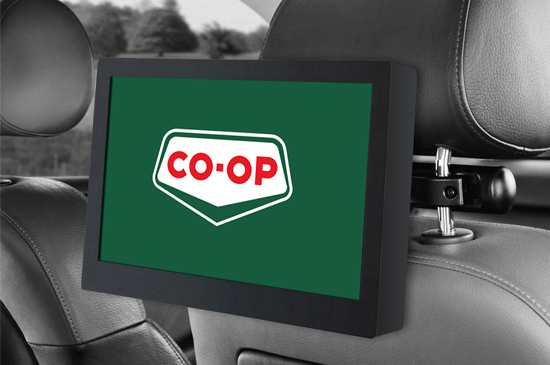 The displays will play a loop of advertisements to customers in a non-intrusive way, thus providing a great experience for CO-OP Taxi customers. Advertisers will be able to display both static and video advertisements for a specified time. Advertisements will cover the entire display thus providing advertiser’s exclusive readership of the content on the display. A customer taking a taxi ride is a captive audience for the time they’re in the car. This makes digital signage in this environment the perfect advertising vehicle [DOOH] but also the perfect medium to provide informative and helpful information to improve their journey.